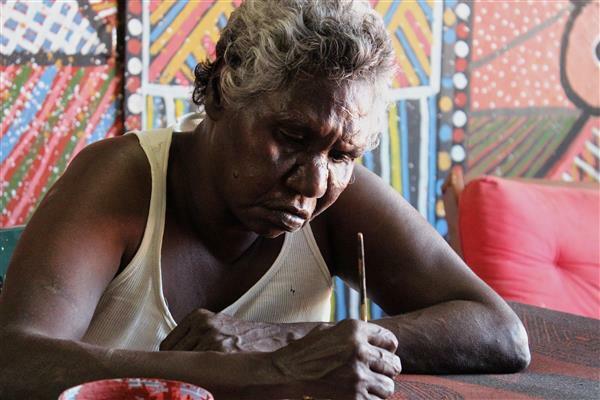 Reppie Orsto has worked at Munupi Arts & Crafts since its beginnings in 1985, producing intricate fabric and t-shirt designs as well as paintings. Reppie Orsto also spent some time in 1989 producing designs for the Territoriana label in Darwin. Reppie Orsto participated in Munupi’s first printmaking workshop in Canberra in 1990. In June 1992 she travelled to Paris to attend the opening of the Munupi Exhibition at The Australian Embassy. In August 1994 Reppie Orsto attended, at the invitation of the Canadian Government, the exhibition “Epama Epam! Everything has Meaning: An Exhibition of Contemporary Aboriginal Art from Australia” to coincide with the Olympic Games. In 2002 Reppie Orsto had her first solo show at Gallery Gabrielle Pizzi in Melbourne.